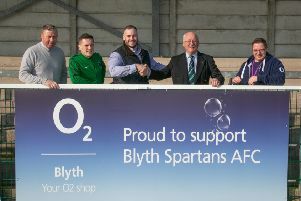 Liam Gillesphey and Kyle Oliver scored two goals apiece as Blyth AFC thrashed West Allotment Celtic 5-0 in difficult conditions at South Newsham, writes Andrew McDonnell. During a frustrating first 45 minutes, Michael Chilton missed a penalty to give the Braves the lead as the game was goalless at half-time. Gillesphey broke the deadlock three minutes after the break, and doubled the hosts’ advantage with a stunning strike into the top corner 10 minutes later. Ryan McGorrigan missed a chance to pull a goal back from the penalty spot on 62 minutes, however, the hosts scored three goals, through Liam Hudson and Oliver, inside the final six minutes to wrap up a dominant second-half. The Braves move up to second in the table – albeit having played more games than the teams around them – and have a week to prepare for the trip to Crook Town next Saturday. It was the visitors that had the first chance of the game, with Zayd Muhammed firing wide of Bannon’s goal after 10 minutes and the hosts went close at the other end through Gillesphey four minutes later. McGorrigan, who was returning to South Newsham for the first time since signing for Allotment, blazed over the bar before the home side had a chance to open the scoring. After a handball in the area, Chilton’s spot kick was saved by Sam Taylor, and the ‘keeper was called into action once more on 29 minutes as David Robinson’s effort was pushed round the post. Luke Parkinson’s free-kick from the right five minutes before half-time found Elliot Mitchell, who got to the ball ahead of the approaching Bannon and headed wide. It was certainly a half of frustration for the hosts, but the Braves come out rejuvenated after the break and opened the scoring on 48 minutes. Moments after Chilton was denied by Taylor in the Allotment goal, John Parker glanced a Sean McRoberts’ corner on and Gillesphey pounced to prod the ball home on the volley. McRoberts and Chilton both went close before the home side doubled their lead on 58 minutes. A clearance from Allotment was gathered by Gillesphey, and then the midfielder struck beautifully into the top corner – a goal-of-the-season contender. McDonald and Skinner’s side certainly enjoyed the majority of possession and their dominance certainly paid off inside the closing stages of the contest. Robinson intercepted the ball in midfield and handed the ball to McRoberts. The wide man threaded the ball to Hudson, who latched onto the pass before finding the bottom corner. Substitute Oliver inflicted further misery on Allotment, he latched onto a loose ball in the Allotment penalty area and calmly side-footed the ball home. The former Middlesbrough Academy man produced another goal-of-the-season contender, to go with Gillsphey’s earlier effort, on 90 minutes. The ball made its way across to Oliver, who saw the ‘keeper off his line, and he guided the ball up and over and into the net. McRoberts had a chance to wrap up the victory even further, but sliced wide in additional time. The Braves completed an impressive victory, with all goals coming in the second half.